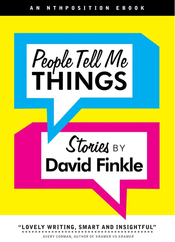 David Finkle is a New York-based writer who concentrates on politics and the arts. He writes regularly on theater, books and music for New York Stage Review, The Clyde Fitch Report and The Village Voice. He's contributed to scores of publications, including The New York Times, New York Post, The Nation, The New Yorker, New York, Vogue, Mirabella, Harper's Bazaar and American Theatre. He is the author of People Tell Me Things, a story collection, The Man With the Overcoat, a novel, and Humpty Trumpty Hit a Brick Wall: Donald J. Trump's First Year in Verse. Depressed and defeated, facing the inauguration day of a new U.S. President he calls "flabbergastingly unfit for office", writer David Finkle put thought and pen to the internet and posted a series of opinion-driven quatrains on Facebook. On day 2, still unable to climb out of his funk, Finkle wrote another, and another, and another, finding himself three hundred sixty-six days later with a new dose of acerbic wit and humor for every day of Donald Trump's first year in office, including an anniversary verse to complete the cycle. "Finkle is that rare writer who achieves great effects without seeming to try." ​"Great Dates With Some Late Greats." In each one a famous dead person appears in the life of someone who needs help in some way.